Megatron changes weapons continuously to catch Autobots by surprise. And now for the guy who needs no introduction. 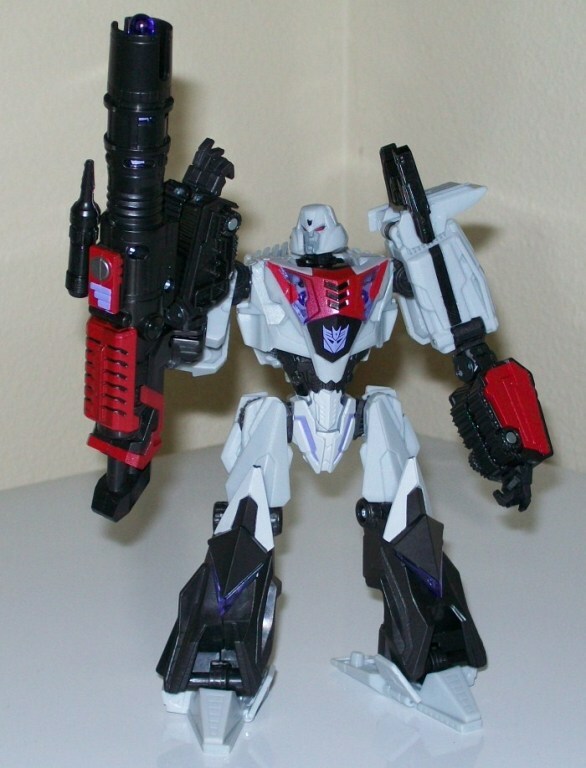 Here he is, in his War for Cybertron video game incarnation: the mighty, indomitable Megatron. But is he worth adding to your collection? First, I must admit something bizarre and strangely shameful: this Cybertronian Megatron represents the first and only Megatron I�ve ever owned. When I was a kid, I came to the Transformers game a few years late, and thus missed the chance to obtain a true G1 Megatron. (Curse those effete parental concerns about realistic-looking firearm toys!) Galvatron appeared under the Christmas tree one year, but he just wasn�t the real deal. He wasn�t Megs. Over the years, later versions of Megatron never grabbed my interest enough to warrant a purchase. The alt modes always stank, or the robot modes stank, or both. This rendition, however, peaked my interest. The low price point and heavy G1 nods enticed me. After I took this pocket-sized Megatron home, I wasn�t disappointed. This Megatron comes packaged in robot mode, and that�s certainly by design. Simply put, his robot mode looks awesome. The styling is sort of a nifty halfway point between the alien, angular aesthetic of the movie designs and the simpler, boxy G1 look. What�s key for me is that this version looks like Megatron �- which is more than I can say for the movie rendition. He possesses the powerful poise, the menacing face, and the big ol� gun on his arm. The black, white and red colour scheme is nicely accented by some nifty, transparent purple highlights. (Really, how can you argue with a figure that has light-piping in its legs as well as its eyes?) There are some places on my figure where the paint application could have been neater, but I�m not griping; there�s a ton of paint on this toy, and that goes a long way toward making this figure look as great as it does. The eyes in particular are a rather unusual affair: they feature the aforementioned purple light-piping, but they�re also painted red in the center. This results in eyes that glow faintly purple around their edges when held up to the light � a nice touch, in my opinion. In terms of poseability, this Megatron is rock solid. His joints are nice and stiff in the legs and his feet are enormous, making most standing poses a breeze. You could probably stand this dude up on the back of a moving dachshund with little difficulty. The shoulder joints, however, are more limited in movement and restrict the directions in which Megatron can point his big, freakin� gun. The head lacks the ball joint that we all desire, but it�s mounted to a panel that can tilt up and down, so Megs can look in myriad directions with ease. 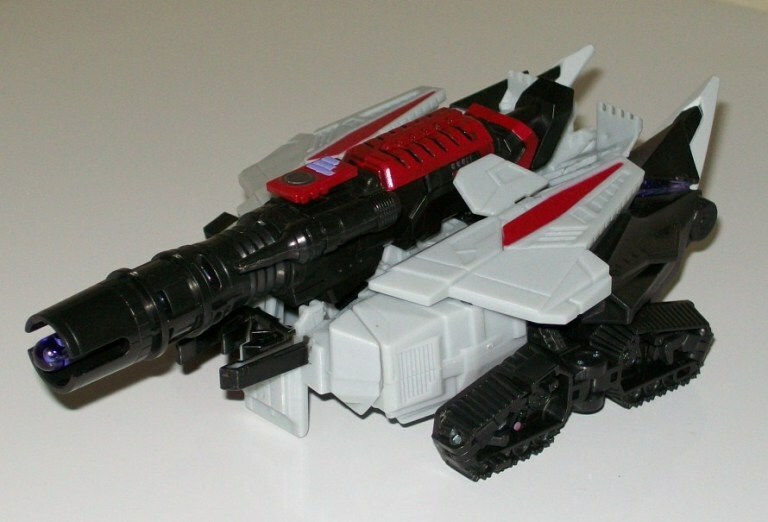 Alt-mode on this Megatron isn�t exactly the main selling point, but it�s worth a look. Megatron now turns into a vaguely tank-like � thing which can flip its treads beneath its body to convert to �hover mode�. (I adamantly refuse to call this a triple changer.) To my mind, the alt mode looks more like a flying saucer than a tank, but it�s undeniably cool in concept. The gun comes off, and must be removed and reattached for conversion. That suits me far better than the awkward configurations we saw in the movie Brawl and Generations Galvatron figures, where the arm cannons remained attached throughout transformation. 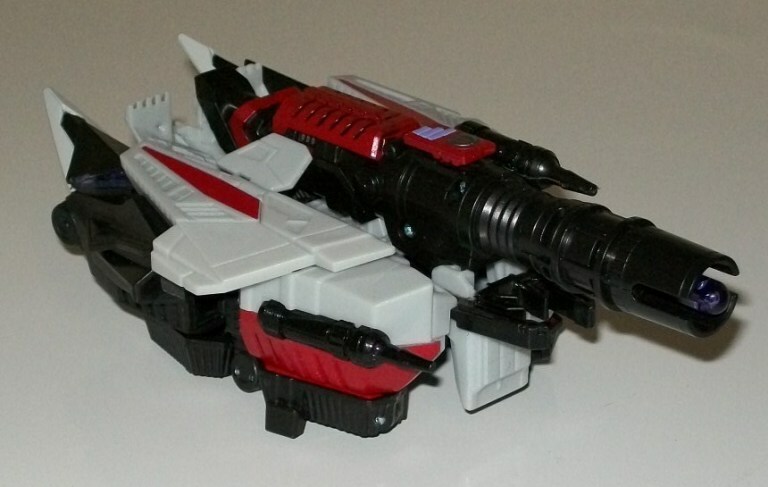 You can even make Megatron a leftie if you want by mounting the cannon on the other arm. Southpaws rejoice in unison! Transformation Design: 8 � Simple, elegant and wholly unique. Some might find this transformation on the easy side, but there�s nothing wrong with a quick conversion. Fun: 9 � A mean-looking Megs with some great poses, a decent alt mode and a firing projectile to boot. That�s my definition of fun. Aesthetics: 9 � Looks like Megatron. Smells like Megatron. It�s like someone took G1 Megatron, filtered out all the 80�s cheesiness and purified the remaining product with a tiny shot of Michael Bay goodness. Articulation: 7 � Good articulation on all joints except the shoulders, which had to spoil the party with their bulky awkwardness. Overall: 9 � Cybertronian Megatron is simply a must-buy for any fans of the G1 design. Go. Get him now.